Finally out from under wraps, the long-awaited 2018 Honda Civic Type R has been unveiled. As the first Type R vehicle to make its way to Canada, Civic fans can expect to go faster, drive longer and be completely agile on the road. The Type R is the highest level performance version of the Civic available and will blow you away the moment you sit behind the leather-wrapped wheel. Are you ready for the 2018 Honda Civic Type R in Muskoka? The Honda Civic has been challenging the small car industry to do more and this performance model keeps that expectation alive. From the sporty exterior to the powerful engine, every piece of the 2018 Civic Type R has been engineered for capability. There is no better vehicle to introduce Type R to Canada with. The 2018 Honda Civic Type R gives a breathtaking performance. The Civic Type R will officially launch in summer 2018. It will be manufactured by Honda of the U.K. Manufacturing in their Swindon, England plant. 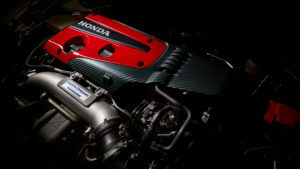 The turbocharged engine, however, will be engineered and manufactured on North American soil at Honda’s state-of-the-art Anna, Ohio plant. Contact us below to learn more, and stay in the loop about the 2018 Honda Civic Type R’s Canadian debut. We will let you know when it’s available to test drive and see in person here in Muskoka. You can also browse the rest of the large line-up of 2018 Civic’s online or come in to test-drive one today. We offer the whole range including the new 2018 Civic Si. As one of the most reliable and safe vehicles, investing in a second hand Civic is also a great option. 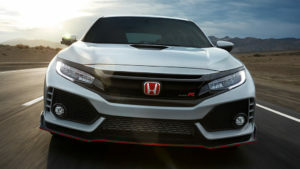 Type R is the branding Honda gives its top performance models. When the Type R decal is added you can be ensured that the vehicle will be adrenaline driven. The 2018 Civic Type R features a North American built 2.0L i-VTEC direct-injection turbocharged engine. With max outputs of 306-horsepower and 295 lb-ft of torque, this small car has more power than some SUVs. 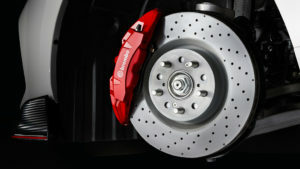 The perfected engine is exclusively paired with a short-throw 6-speed manual transmission with rev matching capability. The chassis has been engineered to perfection on this front-wheel drive, featuring a new dual-axis front suspension and dual pinion electric power steering, both of which improve cornering and agility. The Civic Type R shares a similar body style to the hatchback Civic, with 5 doors there is ample cargo space. LED headlights, fog-lights, brake-lights and turn signals blend smoothly into the sleek and sporty exterior design. The Civic Type R is designed to reduce cabin noise and vibration for a smoother drive. The body uses a combination of ultra-high-strength steel and aluminum to reduce weight while maximizing performance for a 16kg body mass reduction. 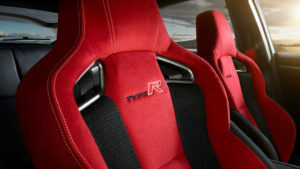 There are three driving modes available on the Civic Type R: Comfort, Sport and the exclusive R+. Each of the modes adjusts the drive to maximize capability and improve dynamic response. The 2018 Civic Type R is engineered for all driving conditions. The 2018 Civic Type R is available in one trim level which was meticulously designed with premium content and features. The moment you sit in the red/black bolstered sports seats you’ll be ready to drive, especially when you clutch the leather-wrapped shift knob. You can program everything you need on the 7-inch display featuring smartphone integration, SiriusXM capability, Bluetooth compatibility and Honda navigation system. These features will be amplified as you listen to them on the premium 12-speaker audio system. You’ll never want to stop driving after you put your foot on the racing pedals. Honda has always taken safety seriously in every vehicle that they have designed. The 2018 Honda Civic Type R is no different. One of the biggest safety features on the Type R is the Honda LaneWatch blind spot display. This will ensure that you know what is happening around your vehicle as you drive and ensure you’re always safely merging and changing lanes. The headlights increase visibility, while the body structure is designed to withstand increased collision impact. If you’re looking for Honda Civic parts and accessories then look no further than the Parts Department at Jason Armstrong’s’ Huntsville Honda in Muskoka, ON. We carry a variety of genuine OEM parts so you can find the perfect vehicle part for your Civic in Muskoka, Huntsville, Bracebridge, Burks Falls, Parry Sound, Port Carling, Orillia, North Bay and Haliburton.